High above the casinos of South Lake Tahoe, Adam De Vos’s daylong gamble almost paid off with the biggest win of his young career. The Rally Cycling rider took a chance on a long breakaway and finished second in the toughest stage of the 2016 Amgen Tour of California. At the same time De Vos was infiltrating the day’s breakaway on the 131-mile stage, Sara Poidevin was staking her claim as one of the best climbers in the peloton in stage one of the women’s event. 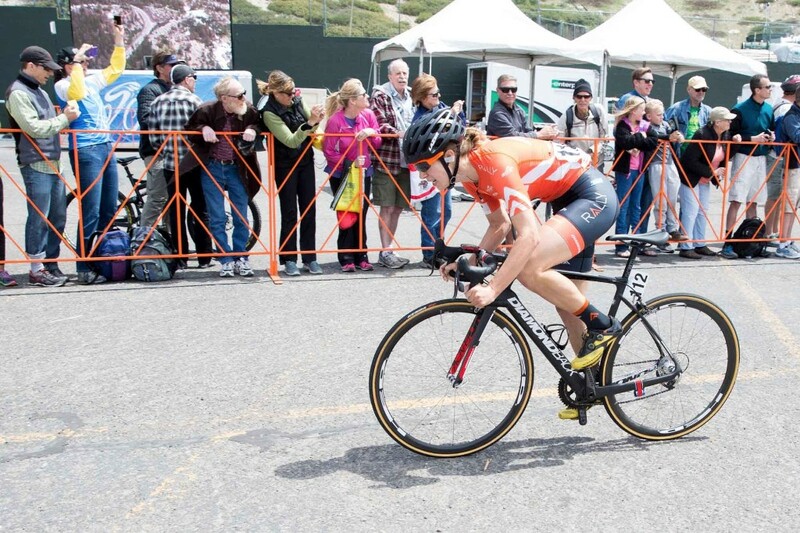 Adam De Vos kept Rally Cycling’s breakaway streak alive on the road to South Lake Tahoe. De Vos made it into an early break that included 17 other riders. Despite the large amount of firepower in the move, the peloton held the gap at around the three to four minute mark for most of the day. Heading into the first KOM of the day. De Vos and Toms Skujins (Cannondale) broke clear from the break and fought out the sprint between the two of them. De Vos would come out on top and repeat his performance at the second KOM. Shortly after, the duo were reeled in by the 14 remaining riders of the breakaway. Despite the break coming back together, De Vos wasn’t finished and when the breakaway fractured a second time he was in the front group – again with Skujins, this time with Xabier Zandio (Sky) joining them. The three worked well together and with 20 kilometers remaining they had a gap of 3:00. The gap held steady until the final 2-kilometer climb to the finish. De Vos marked Zandio and Skujins coming into the final corner before launching his sprint. He quickly got a bike length on his two breakaway companions but was unable to fend off Skujins, who came by on the outside to take the win. With De Vos taking maximum points in the King of the Mountains competition from the breakaway, Rally Cycling rode in defense of Rob Britton’s ninth place on general classification. De Vos’s breakaway performance, like that of Will Routley’s yesterday, assured that Evan Huffman remained in the King of the Mountains jersey. In the women’s event, Sara Poidevin again showed that she is one of the top climbers in the peloton by grabbing the first Queen of the Mountains points of the race. With only two categorized climbs on the 72-mile route, Poidevin was well placed to take the polka dot jersey at the end of the day. On the final climb to the finish Poidevin was gapped from the front group and finished in 21st place. Crossing the line first, Megan Guarnier (Boels–Dolmans) took the win and the QOM points – moving her into a tie for the lead in the QOM competition. As the winner of the stage, Guarnier claimed the leader’s yellow jersey with Poidevin taking the QOM jersey. Tomorrow is stage 6 of the men’s race and stage 2 for the women. The men face a tough 20.3-kilometer individual time trial while the women ride together in a team time trial over the same distance. The women of Rally Cycling are the National Team Time Trial Champions and will look to prove their strength against the best teams in the world.